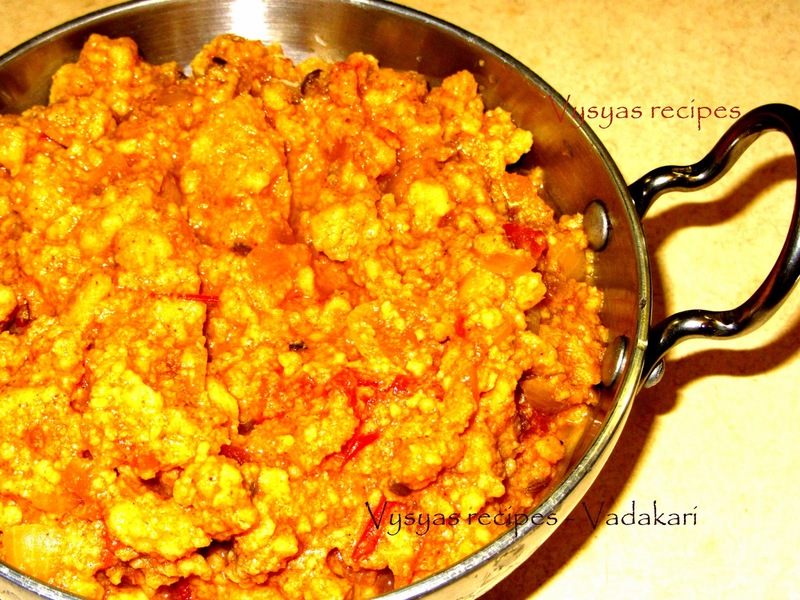 Vada kari(vadacurry) is Multipurpose gravy which goes very well with Idli,Dosa, Parotta,set dosa and chapati. 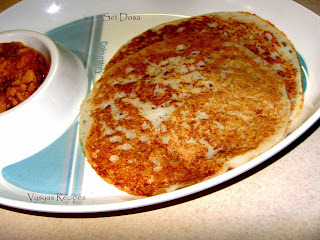 Set Dosa with Vadakari is also a very good combinaton. Vada kari is prepared with Chana Dal.I have explained Vadakari with stepwise pictures.Chana dal is extremely delicious in taste, full of nutritious and can be digested easily.Coarsely crushed chana dal increases the nutritional value, which is ultimately beneficial for the health.Chana dal is low in fat and high in fiber and considered as polyunsaturated.Now we learn to make Delicious Vadakari. garlic - 7 or 8. Chana Dal - 1 cup. cinammon sticks - 1 inch. Soak chana dal in 2 hrs of water.Grind fennel seeds,greenchillies,salt,cinnammon sticks for 5 seconds, then drain the chana dal that we Soaked already and grind it into a coarse paste in a blender. Chop pearl onions,tomato and garlic into fine pieces and keep it aside. Soak tamarind in water to prepare tamarind extract. Crumble the fried dumplings into pieces and keep it aside. Take a Kadai, heat the oil add bay leaves,fennel seeds,ginger and garlic paste, saute it, then add pearl onions and garlic saute well. Add tomato saute well till mushy,add turmeric,chilli powder,saute well, then add needed water add tamarind extract, when it starts boiling, add crumbled dumplings that we prepared already. Mix well.These vadas will absorb water, so add needed water according to consistency,add salt, stir well. Allow it to boil till it becomes thick gravy.garnish with cilantro. Note : it goes well with Set Dosa, dosa, chapathi,idli.